In the new economy where value drivers are shifting from tangible to intangibles resources, brands are the most familiar asset. They are well known by consumers, perceived as a critical component of enterprise value and often motivate large mergers and acquisitions. Yet, brands are a complex intangible asset, and their valuation is a difficult task requiring a variety of expertise: legal, economic, financial, sector-specific and marketing. 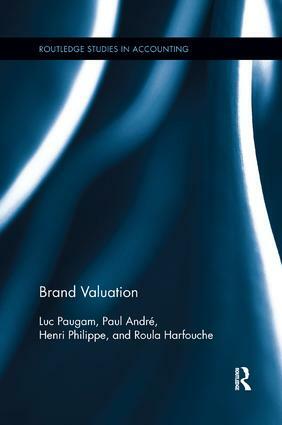 Using rigorous methodologies, an analysis of the world of the new economy and an inquiry into the limits of modern valuation technics, this book offers empirical and theoretical background to the key issue of brand valuation. It provides answers to the many questions that arise when attempting to value a brand: How to understand the origin of brand value? How to assess its value objectively? Why valuations of some brands by consulting firms differ so widely? How to understand that some brands are valued millions of euros when the companies that own them are losing money? Brand Valuation explains the economics and finance factors explaining the value and volatility of brands and presents the most commonly used methodologies to value brands such as the cost methods, the excess earnings approach, the relief-from-royalty method or the excess revenue approach. The methodologies covered are illustrated with numerous examples allowing the reader to grasp the advantages and limits of each valuation techniques. The book presents the relevant context of brand valuation including the applicable existing accounting and valuation standards and also discusses the models developed by consulting firms. Luc Paugam is an Associate Professor at ESSEC Business School, France. Paul André is a Professor at HEC Lausanne at University of Lausanne, Switzerland. Henri Philippe is a Partner at Accuracy in Paris, a corporate finance consulting firm, and teaches finance at the University Paris-Dauphine, HEC Paris, and Ecole Nationale des Ponts & Chaussées, France. Roula Harfouche is a Fellow of the Institute of Chartered Accountants in England & Wales and a partner at Accuracy London, UK.